Washington’s Energy Facility Site Evaluation Council (EFSEC) held its final major public hearing on the Tesoro Savage oil-by-rail terminal, with over 200 attendees during the rally and 300 attendees throughout the day urging Governor Inslee and EFSEC to deny the largest proposed oil terminal in North America. EFSEC collected public comments on the draft air pollution permit for Tesoro, the largest proposed oil train terminal in North America. This was likely the public’s last chance to weigh in before EFSEC makes a final recommendation to Governor Inslee. Learn more about the Tesoro Savage proposal here. 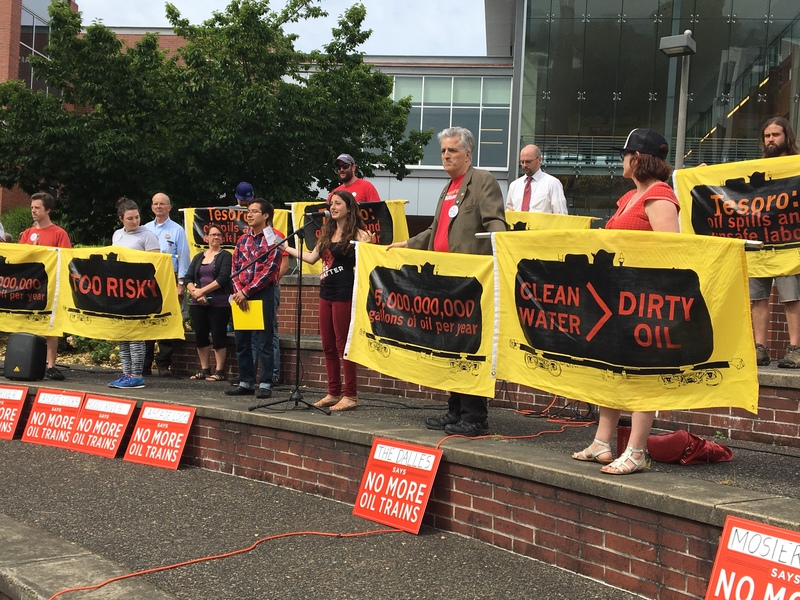 What’s Next for Oil-by-Rail in the Pacific NW? In the coming months, Washington’s Energy Facility Siting Evaluation Council (EFSEC) will make a recommendation on the Tesoro Savage proposal in Vancouver, Washington. Ultimately, Washington Governor Inslee will make the final decision about whether to deny the terminal which would be the largest oil train terminal in North America. The project would bring up to five loaded oil trains each day through the Columbia River Gorge carrying the same volatile Bakken crude oil that burned during the Mosier derailment in June 2016. Video archives of speaker portion of the rally via facebook.com/columbiariverkeeper; with tweets via @standuptooil and #StandUpToOil. Expert testimony of Dr. Sahu regarding volatile organic compound and carbon dioxide emissions. Expert testimony of Dr. Elinor Fanning on the health implications of Tesoro’s air pollution. Factsheet re: air pollution impacts of Tesoro’s proposed terminal.